Washington, DC | October 5 – On Tuesday at the Initiative for a Competitive Inner City (ICIC) 19th Annual Awards and Conference in Boston, Bo Menkiti, CEO of The Menkiti Group and Keller Williams Capital Properties was honored with the Marcia Lamb Inner City Innovation award, and presented the keynote address for the conference. Click for the video profile on Bo and The Menkiti Group as shared at the conference award event. 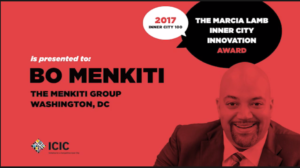 During the event, ICIC and Fortune magazine announced that Keller Williams Capital Properties (KWCP), the affiliate real estate brokerage of The Menkiti Group, has again made the 2017 Inner City 100 list, which ranks the fastest-growing inner city businesses in America by revenue growth. 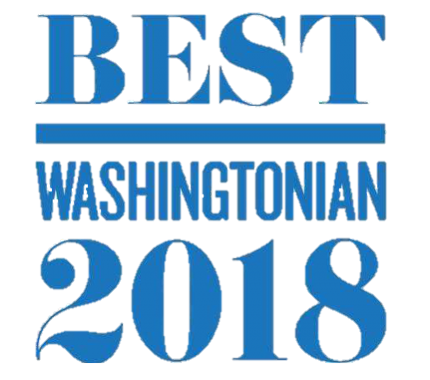 KWCP has appeared on this list consistently since 2014. KWCP ranked 49th on the list of 100, and reported 2016 revenues of $62 million, and a five-year growth rate of 161.84% from 2012-2016, recording the second-fastest growth rate out of all brokerages nationwide during that time. KWCP Managing Partner and Co-Founder Brandon Green accepted the award on behalf of the brokerage. The KWCP feature and the full list is available on Fortune’s website. ICIC’s Inner City 100 list seeks to celebrate and enable urban entrepreneurship with an annual ranking of high-growth companies in urban areas. Over the course of nearly 20 years, ICIC has awarded 928 companies whose success illuminates the innovation and business growth happening in our inner cities, and these companies have created more than 140,000 jobs. The Menkiti Group was ranked on the list for four consecutive years, 2012-2015. To learn more about Keller Williams Capital Properties or to discuss business and career opportunities, please contact Brandon Green at 202-350-9777. ICIC is a national nonprofit founded by Harvard Business School professor Michael E. Porter. ICIC’s mission is to promote economic prosperity in America’s inner cities through private sector investment that leads to jobs, income and wealth creation for local residents. Through its research on inner city economies, ICIC provides businesses, governments, and investors with the most comprehensive and actionable information in the field about urban market opportunities. The organization supports urban businesses through the Inner City 100, Inner City Capital Connections and the Goldman Sachs 10,000 Small Businesses programs. To learn more, visit ICIC.org.